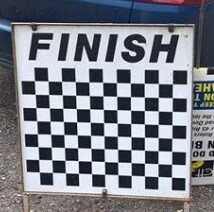 This Event used the “Roadworks 10” (1U/10B) course. 18 riders signed on the dotted line for the final Tuesday evening F and F (fun and frolics? … fast and furious?… insert your own description here). With ‘The Moose’ a DNS it was the responsibility of another 2nd claim HNCC/TSE rider, Gavin Ashfield, to prop up the field. Don’t ask me about wind direction. I have no idea but it remained relatively warm and calm (we have been very lucky with the weather this season, perhaps due to lack of ‘TSE tandem’). Ella Ruggles got proceedings to a flying start sporting her recently purchased skin suit. Nick Hickman’s Brompton, all dressed up with clip on tri bars, did not make its much anticipated season debut due to a technical malfunction and was replaced by his trusty medium gear 72″ fixed. Another that did not make it to the start line was Paul French who punctured following sign on. He wasn’t even wearing Paul Wright’s unlucky pink overshoes. Nobody made any unscheduled detours except for the ‘count down assistant’ who required a quick visit to the nearby public house once all riders had/were pushed off. Given he is 9 yrs old it wasn’t for a beer! Fastest of the evening was Jason Stuart (CCA) despite his rear light trying to make a break for it early on in his ride. Quickest Nomad was Gavin Ashfield. Congratulations to David Heath who achieved his season target of ‘evens’ on a 10. His first words after crossing the line were ‘I feel sick’… well that’s how you know you left it all on the road David. Ella Ruggles edged her way closer to breaking ‘evens’. Next season she will no doubt achieve this. Our next Club Time Trial uses the fast F1B/10 course (Tempsford to Biggleswade Sainsbury’s RAB and back along the A1) on Sunday 9th September 2018. Look out for call for entries on Facebook soon. There will be no entry on the day.